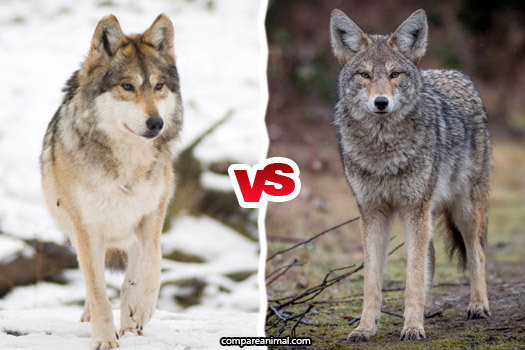 Who will win the fight between Coyote and Wolf? There must have been a time in your life when you would have got confused between a coyote and a wolf as they both resemble the same in many factors. They both belong to the same family, Canine and often lead a similar lifestyle and hence are often treated as same. But there are a number of differences between the two on the basis of certain factors. Let us understand the Coyote and Gray Wolf family one by one and then you will be in a position to distinguish between the two. Coyote or Canis Latrans are mostly found in America and can easily adapt to any weather conditions. They can be often seen in the grasslands, forests and deserts of Northern America. They belong to the family of dog and resemble the structure as well. Coyotes are the really fast animal and can reach a speed of 40 mph when necessary. Coyotes are widely known for howling at the moon. They basically howl to communicate with each other at a certain location. They usually hunt at night. They belong to a group of smart and intelligent animals. They can hear any type of sound clearly and have great eyesight. Coyotes are smaller than wolves and similar to a medium sized dog. The length from head to bottom is about 36 inches or 90 cm. The tail is around 16 inches (41 cm) long. Coyotes are not that much heavy and their weights vary from 20-51 lb. The colour of their fur is usually grey, brown or white. This colour depends upon the place where they live. They are known for their teamwork that they show while hunting. They are a highly intelligent animal and hence mostly hunt in groups. Coyotes normally eat small creatures like rodents, fish, frog, etc. They are not very picky about what they eat and are an omnivorous animal which means they eat both meat and vegetation. Coyotes are also known to hunt for snakes and other reptiles as well. Their mating period is around February and March. The female gives birth to the offspring in groups. This group number can vary from 3 to 12. Both the male and female take care of their baby carefully. Coyotes sometimes also mate with dogs and their babies are known as coydogs. Coyotes are not an endangered animal and their population varies from normal to high. They help farmers by killing the rodents and the other insects that may harm the crop. Wolf also belongs to the same family, Canine, as Coyote does. 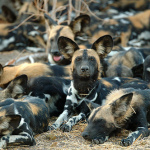 In the canine family, their population is highest except for some dog species. They eat meat and are dangerous animals. Though they are an intelligent animal, from past few years, they have earned a bad reputation for their extreme wild work in which they also killed humans. 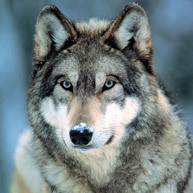 The life-span of an average wolf varies from 6 to 13 years whereas few can live up to 20 years. They are larger than coyotes hence are more dangerous. The normal length of a wolf varies from 40 to 65 inches (from mouth to tail) whereas the weight can go up to 200 lbs. Due to their bigger size than coyotes they are considered to be more dangerous than coyotes. They are known to cover a long range and can travel a distance of up to 3,728 miles if required. Hence they possess a great stamina which is also one of the reasons that they are dangerous animals. They are found at many places in the world hence the size and colour of them also vary from place to place. Their lifestyle also changes from place to place. The leader of the male group is known as an alpha male whereas the leader of the female group is known as an alpha female. Wolves are known for their unity and when a young takes to birth the entire group take care of that offspring. Their speed can go up to 43 miles per hour in extreme cases. But they can’t run for a longer period of time. The number in the group of wolves can go up to 40 which show their unity and they also do hunting in groups and in that case, they become more dangerous than usual. The wolf pair will continue to mate until and unless one of the mates dies. Wolf partners are known to live together for many years. It is very evident from the above facts that gray wolves are far more dangerous than coyotes. The size of the wolves and their aggressive nature while hunting makes them a dangerous animal, whereas coyotes are wild animals. 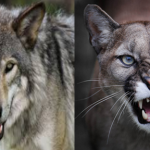 Coyotes are omnivorous whereas Gray Wolves are carnivorous and this fact proves that when the situation arises wolves can tear apart any organism in their way. Coyotes also feed themselves by eating vegetations hence are less dangerous when compared to wolves. 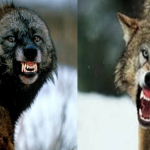 If a coyote and a wolf ever meet then there are high chances that a wolf will win due to its aggressive nature and its size. The wolf has an extra advantage over coyote due to its size and dimensions. Coyotes are lighter and smaller than Wolf. It is better for humans to maintain a distance from both as you never know what is going on their mind. I am going with the wolf. It is larger and stronger than the coyote and has more powerful jaws. Wolves are on record of taking down large prey like Moose solo! Yeah your definitely right AP. In Yellowstone when they released the wolf back they started to notice the decline of coyotes. As it turned out the wolves were killing the coyotes so they had less competition for prey. That and the coyotes didn’t have as good of a food supply as before. Thanks for your comment man. Hopefully Yellowstone does something about the decline of coyotes – I don’t want them to go extinct! Yeah i have family that live up in the Adirondack mountains and there are only coyotes there wolfs did live there until the early 1900s but were hunted away up to Canada. 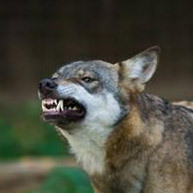 But the thing is that some of the coyotes bred with wolfs so it’s like a small wolf coyote. They are slightly larger than a average coyote and live In packs. They are capable of taking down moose and deer. But I totally agree with the idea of rewilding the wolf back but only two or three packs I don’t want the coyotes to go away. AP have you heard of rewilding in Scotland back to its former forested nature are you for or against it. That is very interesting. Wolves are extremely powerful animals,so it is no wonder that coyote -wolf hybrids are able to take down large prey solo. I have not heard about the rewilding in Scotland. That being said, I am for it as long as it does not involve destroying people’s homes or anything. Also, how is your family doing in the Adirondack mountains? Yeah the rewilding is about how all the highlands were forested but then Britain had them chop down most of them for lumber and took out all the major predators. That left the highlands to what they are now basically a lifeless waste land. And due to the natural predators being hunted away the red deer population is so large that even hunting isn’t enough to keep populations down and due to that the trees can’t grow because the deer just eat the saplings. That’s were rewilding comes in they fence off a couple archers so the deer can’t get in and plant native plant species like Scots pine and when they’re big enough they can take down the fence. After that they are going to try and reintroduce the predators but they aren’t going full out releasing bears and wolves back they will bring the Eurasian lynx they are big enough to take down deer but also stay away from people so it’s not a threat. After a while they will reintroduce the wolf then bear. On some estates they already reintroduced wild boar and moose ( European Elk). In the far north they already reintroduced caribou’s. Wow, that actually seems like a big problem – thank goodness they are doing something about it. My family doing good only problem is that monks have been getting into the chicken coop but other than that it’s pretty nice and laid back up there. I mean monks not monks sorry for writing so much just got caught up. I think the ultimate match up would be a large alpha male grey/timberwolf against a female spotted hyena. 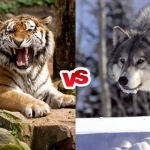 Yes that would be a better match up but I would give that to the wolf mainly due to there more killer nature than hyenas but still would be a close fight.